If you've been listening to the Legend of Retro then you know I love Mega Man style games. That can mean run and gun platformer's to pretty much anything involving or reminiscent of Mega Man. 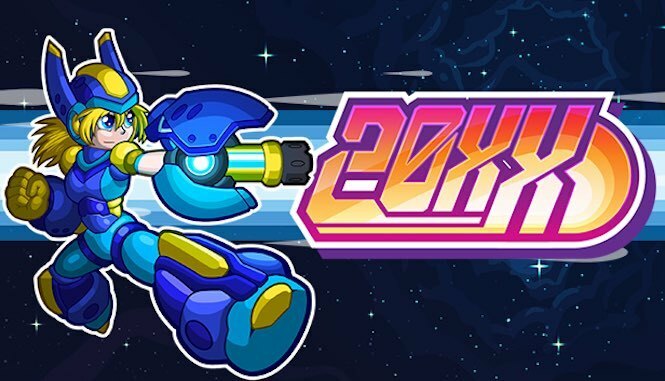 One of the newest installments in this category is 20XX, developed by Batterystaple Games takes the love of Mega Man/X style games and places it into a rougelike action platform video game. With more emphasis on Mega Man X than the former, this game follows the trend of older style indie platform games but executes them with closer to current graphics and online functionality. 20XX allows you to choose between 2 different characters: Ninja and Ace. You are a robot trying to save a world from other rampaging robots. To do this you must fight through a level that involves shooting or slicing enemies, jumping on platforms and not falling into pits or being destroyed by water or fire. At the end of the level you fight the boss of that themed stage. During your play-through you can collect nuts that can be redeemed to improve your robot's abilities such as: Attack Power, Speed, Charging Time, Health, Special Weapon Energy, Armor. This follows the roguelike style gameplay where if you die then all those upgrades you've done during your playthrough are removed. There are however some permanent upgrades you can do and more unlockable powerups you can get while you play. If that's not enough for you then you can also play this co-op with a friend locally or via the internet and there are daily, weekly, and increased difficulty challenges to play. This game offers a lot of content for being so simple of a concept and executes it very well. The difficulty can be adapted to your level of play and offers a lot of variety in however style of play you want to take for your character's progression. Accompanied with co-op play and challenges I can see myself coming back to this game often. While the music doesn't have the same exact feel of a classic Mega Man game it still fits the mold well and doesn't take away from the experience. If you're thinking of picking it up I highly suggest you do if you're looking for something to fill your Mega Man void until 11 comes out. Let me know in the discord if you're into this game or if you are passing on it. As always thank you for taking the time to read this and I'll talk to you again...when the legend continues.